$75 Mail-in Rebate w/ Purchase See More. The built-in RES (Rail Expansion System) can accommodate any Pace Edwards Rack, Thule or Yakima rack to carry any recreational gear above the tonneau cover. Easily access the truck bed or keep it secure while hauling kayaks, surfboards, skis, baskets and more. The Ultra Groove features Paceâs aluminum slats with an ArmorTek overlay laminated to the aluminum. ArmorTek is a weather resistant, padded polymer that delivers extra protection and a smooth, soft top finish. No need to move around the bed of the truck to close the cover. The pull strap makes closing the tonneau cover from the rear of the truck possible. For an effortless retracting action, the Continuous Tension Spring helps pull the cover into the canister for a quick and smooth operation. The improved end caps seal the rear corners of the bed, along with a tailgate seal that covers the width of the tailgate. The Ultra Groove comes with an extra set of drain tubes to cover both the front and rear of the bed. Drilling may be required to install the drain tubes on some models. The Ultra Groove has simple turn-knob styled clamps, for most vehicles, that make it easy to install without the need for a wrench. No drilling needed on most applications. 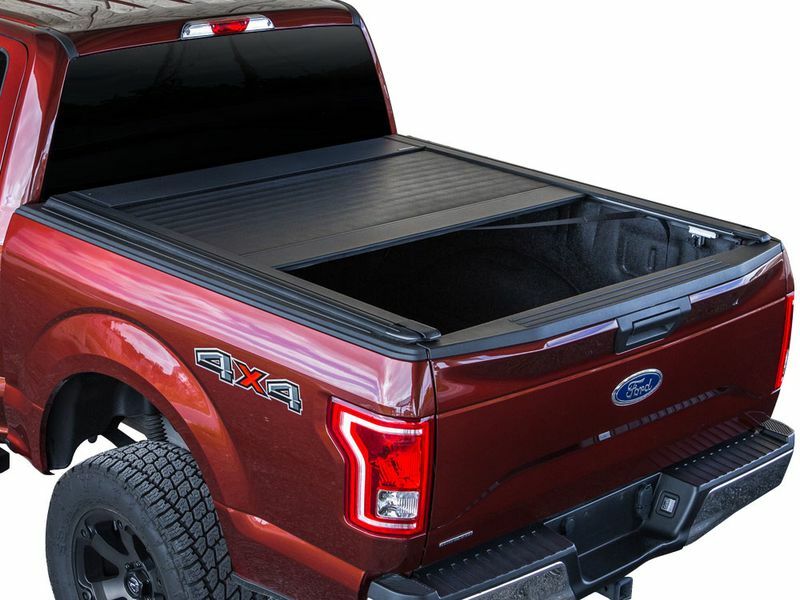 The Pace Edwards UltraGroove tonneau cover is the truck bed cover for work and play. It has a built-in RES (Rail Expansion System) that will accommodate any Pace Edwards Rack and most Thule and Yakima racks. Great for those who want to haul canoes, bicycles, ladders, cargo baskets and more without losing access to their tonneau cover and truck bed. The cover is made from aluminum with an ArmorTek deck overlay. ArmorTek is Pace's padded polymer that is adhered to the aluminum slats. It provides a weather resistant shield that has a high end, soft cover look with matte black finish. This cover is easy to open with one turn on the lock knob, located on the underside of the cover for a clean finish on top. The cover has an easy retracting action due to the heavy-duty Continuous Tension Spring that helps pull the cover into the canister. A useful pull strap helps you close the cover from the rear of the truck, and it can be locked in 12 inch increments. To help with water management, there are drain tubes on the front and rear of the rail, along with extended end caps to help seal off the rear corners of the bed. The rear of the cover has a full length seal that rests above the tailgate for maximum weather protection. Some models may need drilling to install the drain tubes. There is also easy installation! With a no-drill, clamp-in design on most applications, you can actually hand tighten the clamps with the turn-knob style clamps provided for most vehicles. With a three year warranty and so many great features on the Pace Edwards UltraGroove cover, it's hard to pass it up.